This fill-out chart is an aid to help determine if a hybrid or additional fairway metal will help with gaps in yardages. It also can help with what iron may be eliminated and especially if it is a harder to hit iron. Set make-up is a very important club fitting variable that can improve consistency and scoring because the golfer is more confident in the clubs they are playing. Every golfer needs to know how far they hit each club in the bag; not a guess or how far you would like to hit each club, but the actual carry yardage (only the driver is listed as carry plus roll). It can be very helpful to evaluate your current set make-up and decide if a hybrid club may help you by eliminating for example your old fashioned and probably harder to hit #3 iron or possibly your #4 iron. Also, at what distance do you want to be hitting your shortest fairway metal so it fits around the hybrid and your longest hitting iron? 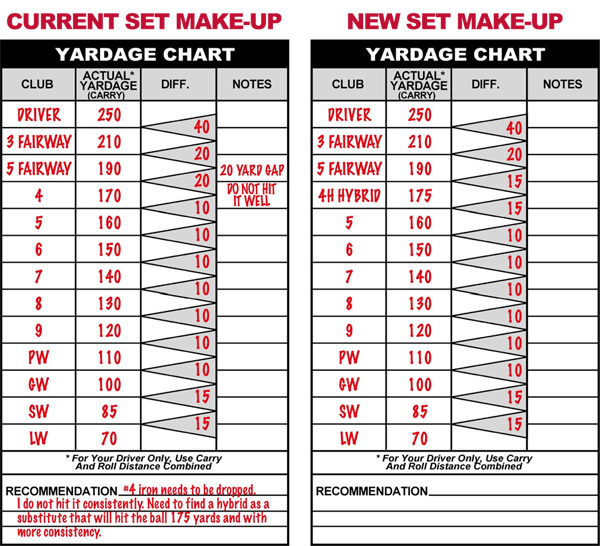 The yardage chart shown here is used to list the yardage for how far you hit each club and also the incremental distance between each club. It will indicate where possible yardage gaps may be too great. Also, it is important to note which clubs you have that seem harder to hit, meaning consistently solid and with good direction control. List all 13 clubs currently being used. Next, record the yardages being sure to use only carry distances with the exception of the driver which is both carry and roll. Subtract the yardage differences between each club and record these in the triangles under “Diff.”. Now, sit back and analyze the data, and make any notes that apply to your game in the “Notes” column.